If you would like to experience the authentic Turunc Turkish Night Show and see firsthand the amazing culture and tradition that differ the Turkish people from all others, then our dazzling Turkish Night Show is just what you need. 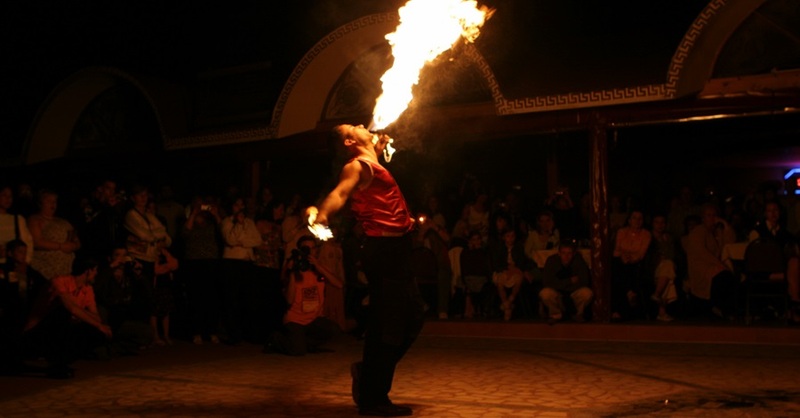 This brilliant Turunc Turkish Night Show starts with a drive from your lodging in Turunc to a Kervansaray in Marmaris, the center of the vibrant Turkish nightlife. Once you arrive and come into the restaurant, you will be greeted by the well-known Turkish hospitality and warmth. Turks are famous for their easy-going approach and cheerful attitude, so you won’t feel out of place at any moment. Friendly staff will make sure you feel welcomed and entertained throughout the night. Kervansaray features a traditionally stylized ambient with lot of colorful pillows with arabesque motifs and oriental lacework. During the night the dinner will be served. The menu is quite broad, so there will be something for everyone, with the mandatory plate of traditional mezes. Aside from the delicious Turkish cuisine, you will also be able to have unlimited amounts of a variety of soft drinks, as well as beer and wine. Throughout the night numerous different dance groups will be taking turn on the stage. 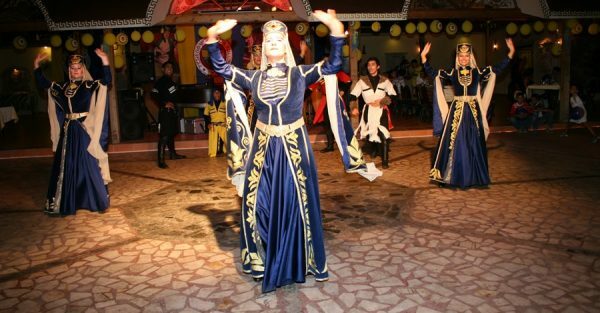 You will get to see some marvelous folk dances performed by some of the best Anatolian folklore groups. 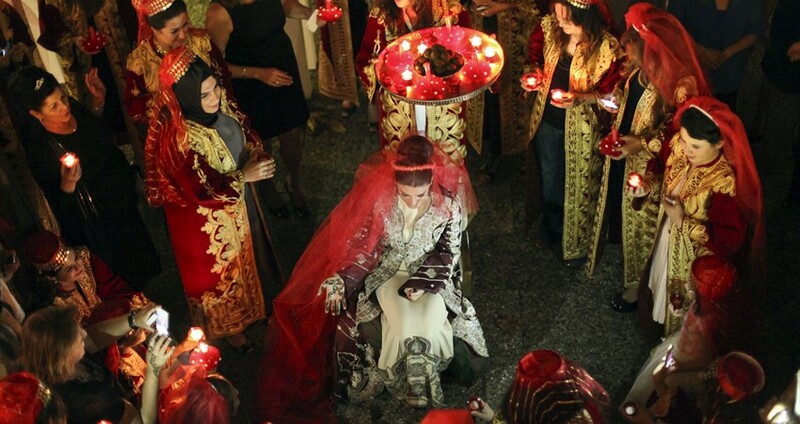 The highlight of the show is belly dance, as well as the performance of a traditional Turkish wedding ceremony, which is always welcomed with great interest. The famous belly dance is performed by some of the most skilled Turkish dancers, and it is truly a captivating experience to watch it live. The price of the tour includes hotel transportation in both directions, entrance fee, dinner and unlimited soft beverages, beer and wine, as well as the full insurance. 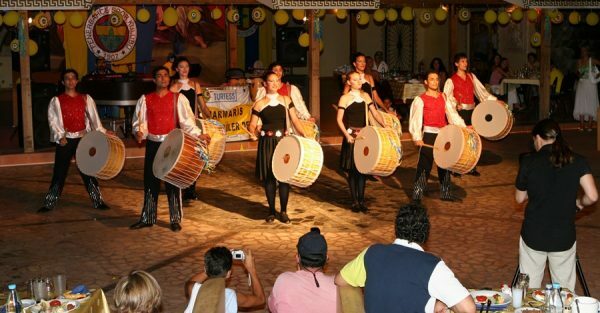 Once the show is over at about 12pm, our driver will take you back to your respective hotel in Turunc. Let us show you the best and most interesting of what our country has to offer, book your spot on this marvelous tour and have an adventure you will never forget. At the end of the night you will have a private transfer back to your hotel in Turunc. You can check all other available Turunc Excursions from here. 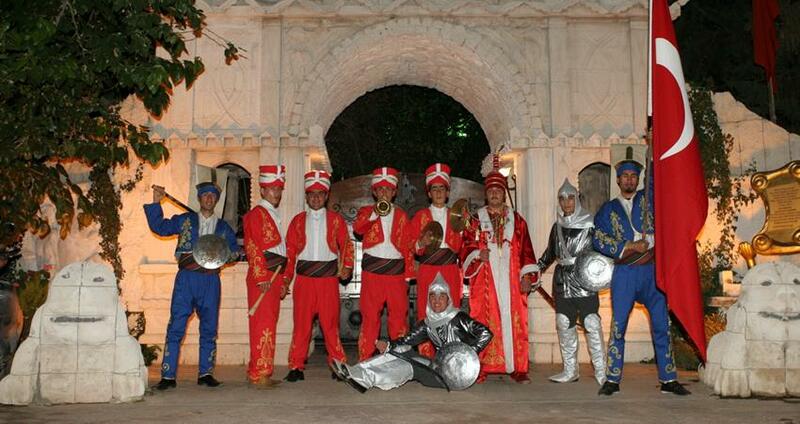 Our authentic Turunc Turkish Night Show begins with a free pick-up ride from your place of stay in Turunc at 7.00pm. After a short and pleasant drive, we will arrive at the splendid Kervansaray. Kervansaray is one of the most popular spots in this part of Turkey and it is known for being the vibrant heart of Turkish nights life. The fabulous show begins as soon as we arrive at the lovely Kervensary. 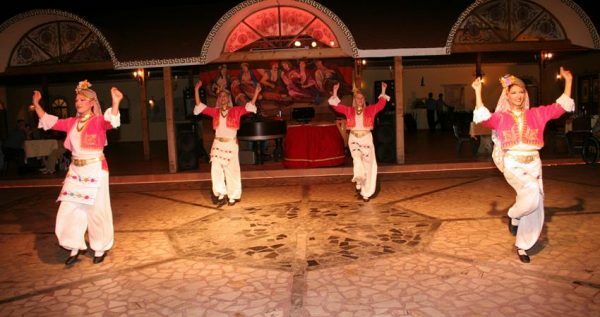 The best and most beloved part of the Turkish Night tour are original Turkish dances, which are truly an art form in its own right. You will be able to see and enjoy several different Turkish folklore dances. However, the most famous of all Turkish dances is the mesmerizing belly dance. Belly dance is the essential part of the Turkish culture and tradition. 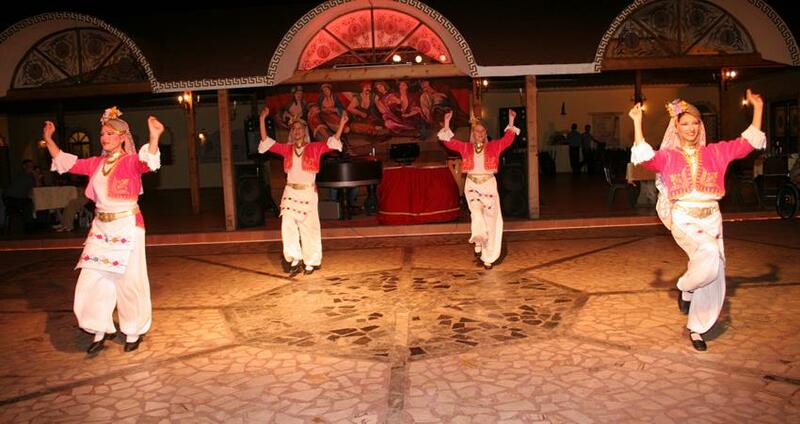 Kervansaray has solely the best and most skillful Turkish dancers performing the captivating belly dance. One of the performances is also the reenactment of a Turkish wedding ceremony. 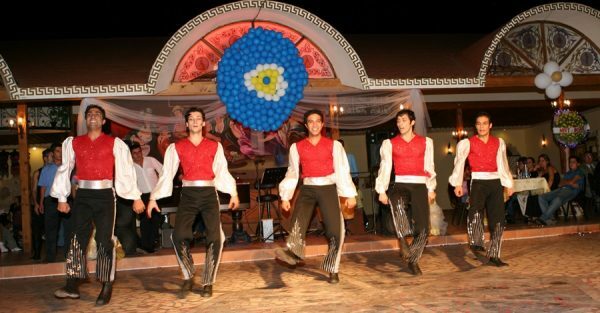 You will get to see some of the most opulent and lavish costumes and hear some amazing melodies performed by a folk music group from Anatolia. Foreign tourists are usually most entertained by the traditional shaving of the groom, as well as the bride’s henna night. During this marvelous night, our welcoming and pleasant staff will serve you a traditional and delectable dinner with typical Turkish meze’s and several cold starters. For the main course there will be chicken, rice as a side dish, and salads. You will also get a chance to drink unlimited amounts of the local wine, soft drinks, and beer. After the show comes to an end at 23.30, our licensed driver will drive you back to your place of stay in Turunc. This transfer is complementary and free of any additional costs. The price of this terrific and entertaining tour includes hotel transfer services, dinner, soft drinks, beer and wine, full insurance package, and entrance fee. We are proud of our “no hidden costs” policy, and our transparent prices. With us, what you see is what you get.